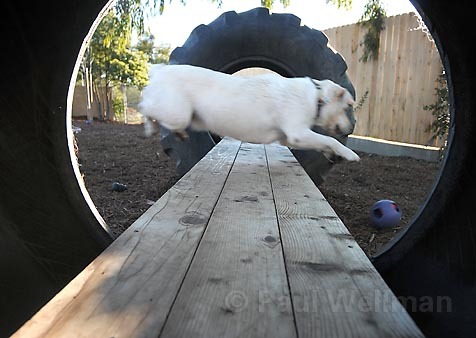 Kirby, a happy customer, leaps for joy at Goleta's Dioji K-9 Resort & Athletic Club. Nestled unassumingly on the northern end of Goleta, Bryce and Jeannie Wendel’s Dioji K-9 Resort & Athletic Club is anything but a day spa for spoiled pups and privileged dog owners. The 10,000-square-foot complex-which offers three age- and size-designated play areas, including a bone-shaped swimming pool-is owned, run, and staffed by a bevy of dog lovers. “We have at least one associate for every 10 dogs : which is way better than any kindergarten kid-to-teacher ratio,” said Bryce. “And all of our employees are certified pet technicians who know first aid.” The staff members, who run Dioji’s expansive merchandise area and office as well as the facility’s enormous “front yard,” are all smiles as they romp with their canine clients, throwing balls, running laps, and indulging in quality snuggle time with some of their smaller, sleepier residents. The Wendels, both 31, explain that they made the jump from investment bankers to doggy daycare owners for a number of reasons. Most importantly, the couple recalled their less-than-pleasing past experiences with daytime dog boarding. “At other places, I would drop off Kirby [my yellow lab retriever] and never see where he’d be staying. When I came to pick her up, I’d ask the employees, ‘How was she today?’ and they’d say, ‘Great! Who are you here to pick up? '” Jeannie explained. At Dioji, every place a dog can be can also be seen by human visitors. Grooming facilities, overnight sleeping spaces (a spacious “bedroom” in every sense of the word), and indoor play spaces are all equipped with large viewing windows, and outdoor play areas are the first thing you see upon visiting the cage-free canine sanctuary. Along with daytime doggy care, Dioji offers a slew of packages and services-all for reasonable prices-that include things as helpful as transportation to and from the facility (located at 7340 Hollister Ave.) and puppy socialization training to items as indulgent as rejuvenating massage and aqua fitness. But the Wendels explain that even the most luxurious of treatments are a far cry from pup pampering. Older, injured, post-op, and arthritic dogs are the most common massage and aqua rehab clients. And they benefit exponentially from the professional, one-on-one sessions. Aside from providing an ideal place for potentially cooped-up dogs to spend the day, the Wendels offer overnight boarding and a fully loaded grooming salon-complete with a post-blow-dry “Zen Den” to keep Fido fresh until he’s ready to head home. Dioji’s 24-hour stay even ensures a peaceful nighttime slumber, with a fully equipped sleeping suite that features cushions, crates, pillows, and human beds, all meant to approximate the comforts of home. And a staff member is on the premises at all times, often hunkering down for the night with their four-legged friends, both to give comfort and keep watch in case of emergency. “These are [our clients’] kids,” the Wendels explained. “And coming here is just like having a nanny.” With their giddy toddler at their feet, and 20-plus happy dogs frolicking before them, one can’t imagine a better, cleaner, or happier daycare center than this. 4•1•1 Dioji K-9 Resort & Athletic Club is located at 7340 Hollister Avenue in Goleta. Call 685-6068 or visit dioji.com.